Hello everyone, CEO Olivia here. As you know there are rescues & shelters for animals all over the country, from big cities to small towns. It’s a sad commentary that they are necessary but here we are. Many of these rescues & shelters are on very tight budgets and rely on donations & volunteers to operate. Today I want to tell you about one group of volunteers called the Freedom Drivers. 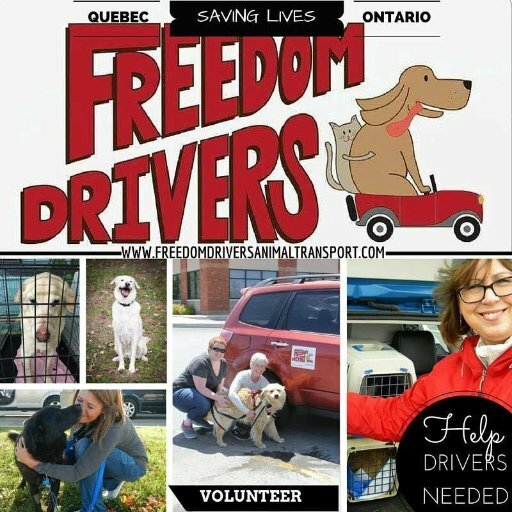 The Freedom Drivers are a group of volunteers who organize ground transportation for Pound Paws, which is a registered Non-Profit organization. Pound Paws work in collaboration with several high-kill pounds & owner surrenders located in Montreal, Canada. They began in 2012, & have helped rescue over 1500 dogs. They presently network with over 50 rescues in Ontario, Quebec, & the Maritimes. The Freedom Drivers are people who volunteer their time, gas & vehicles to drive animals from high kill pounds to shelters & rescues where they stand a chance of a new life. Done in relay fashion with a team of drivers, each freedom driver travels generally about 100 km to meet up with the next driver. This way, great distances can be covered. Pound Paws & the Rescue Drivers are in perpetual need of donations such as dog crates, cat carriers, strong leashes, slip leads, collars, pee pads & blankets. They also rely on financial donations. In order for a dog or cat to be released from a pound, a fee must first be paid. When you donate to the Freedom Drivers (through Pound Paws), it allows them to cover these fees as well as vet cost & other expenses. Pound Paws volunteers visit high kill shelters daily because time isn’t always on their side. A dog or cat may have days or even hours before they are euthanized. For this reason there is a constant need for Freedom Drivers. If you would like to help out through a donation or wish to be a Freedom Driver yourself, you can visit their web site for more information. We wish them all the success too Deanne. What a pawsome group! Wonderful group of folks who can do this. Prayers for their continued successes.